Getting involved in a lawsuit is never a pleasant experience. 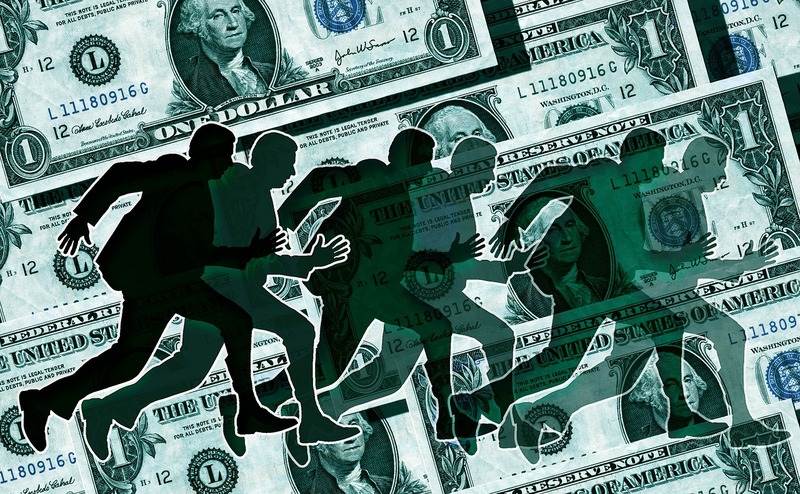 Often times the lawsuit process drags on for quite some time and can be very costly to boot. Not many people set out with the intention of wanting to get sued, but often times by not following the advice of those professionals who are helping us or attempting to do things on our own can lead us down the path of getting sued. 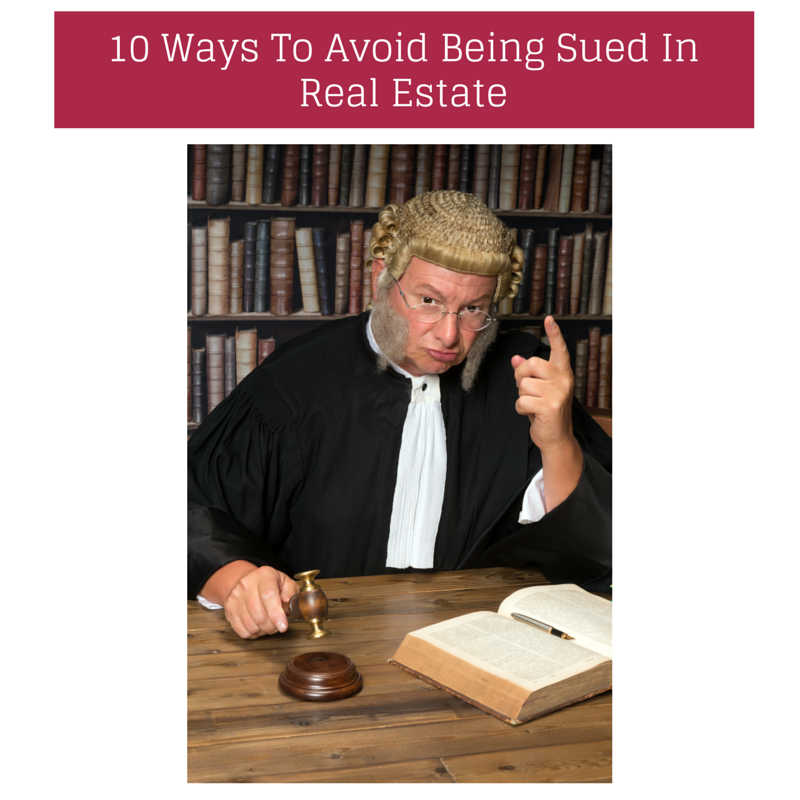 With this article I am providing you with some tips and advice on how to avoid being sued in a real estate. This is by no means intended to replace legal advice from your local attorney, but it should give you ideas of where the pitfalls are to help you better avoid them. The biggest thing that can trip a seller up after a sale has closed will be the lack of making proper disclosures about hidden home defects. With disclosures for residential property you as the seller are required to inform potential buyers of any defects that you know about and are not readily visible. An example of a defect that must be disclosed is where a basement leaks whenever it rains but on most clear and sunny days it may look fine or the effects of the leak have been cleaned up. The failure to disclose to a buyer that the basement has leaks can result in the buyer suing the seller for lack of disclosure. If the issue with the home is noticeable then there is no duty to disclose. So for example in the leaking basement case if there was a huge crack in the wall that is readily visible to anyone who walks by the disclosure need not necessarily be made. You as the seller should still be cautious when filling out government created disclosure forms and make sure you fill out the form accurately even if the issue is easy to see. If a seller is sued for failing to disclose hidden defects then a court can order the seller to pay for repair of the defect and may require additional payments as punishment for any intentional failure to disclose. A much harsher outcome could be a rescission of the contract to purchase the home. Under a rescission (cancellation of the sale) the seller will be required to pay back all money from the sale and take back title and possession of the home. In a rescission the court is trying to put the parties back in the original position they were in prior to entering into the transaction. In order to avoid any of these outcomes always make sure you disclose hidden defects that are known to you. If you have any doubts about something to disclose ask your real estate agent or real estate attorney before hand. See also Avoid Traps with Home Inspection and Disclosures. Take items with you that should stay with the home or were specifically written into the offer as staying with the home and you open yourself up to being sued. Most standard purchase offers require that the refrigerator, stove, dishwasher, built-in microwave stay with the home after the sale. Additional items can be written into the offer such as washer, dryer, custom furniture etc., and those items should be left behind when you move out. Make sure you read and understand the terms of the purchase offer prior to accepting, so you understand what the buyers are wanting you to leave behind. Again if you are not clear on what should stay or what can go with you ask your real estate agent or a real estate attorney. Another problem that could arise comes with replacing nice, quality fixtures with cheap replacements. So don't remove that $500 dollar chandelier and replace it with a cheap knockoff unless you specifically mentioned in the purchase offer than you would not leave that chandelier behind. For more information on fixtures read my article entitled Unconventional Fixtures. The home should be described exactly how it is in all marketing materials. That does not mean you have to describe every aspect in glorious detail, but you should be describing features truthfully. For instance saying the home has a great new heating and cooling (HVAC) system that keeps everything at the perfect temperature could get you into trouble if the system in reality does not do that. If you had an undersized HVAC system installed for the type of home you have, chances are it will have a hard time keeping the temperature right during the extreme hot and cold months. A buyer after moving in and then noticing the lack of ability with the HVAC system after could sue you for the misrepresentation since they were buying under the assumption that the HVAC system properly cooled and heated the home. Another example is misrepresenting about the presence of lead paint. Falsely stating the lead paint has been cleaned up when it in fact has not asking for trouble. If you don't know about the lead paint status in your house, then state that you don't know the status. By stating you don't know you put the buyer on notice that they should be checking for lead paint. That may help avoid a lawsuit in the future. Having clear property title means that the seller has no liens (tax, mechanic or otherwise) and/or no other possible owners in the chain of title that needs to sign off on the sale in addition to you as the seller. Tax or mechanic liens usually can be cleared prior to or upon closing by using funds from the sale of the property. Those liens can be cleared prior to closing only if those liens are properly discovered through a full and proper title search and dealt with by the seller prior to closing. If those liens are undiscovered and later come up after the buyer has taken possession of the home, the buyer can sue the seller to recover the amount it will cost to have the lien removed from the home's title. If there are other ownership interests in the home that the seller was not aware of or simply neglected to bring up and they are not discovered prior to closing, the seller may be subject to a lawsuit by the buyer when those other owners come forward to claim their stake. The term Clouded Title is used where other ownership interests in real estate exist and the true facts of the ownership are not entirely known. So it is in your best interest to disclose all potential other owners of the real estate and make sure they are party to the sale. As a home seller once you sign a listing agreement with your real estate agent and their brokerage you are bound to let the agent market and attempt to sell your home for as long as the contract requires. In many states the listing agreements usually go no longer than six months. Therefore you as the seller should be committed to having your home on the market for six months and keeping everything in great condition for showings. This means allowing as many potentials buyers as you can to enter your house and view it. Yes there may be times it is inconvenient for you and asking some buyers to reschedule should not cause major issues. But if you on a continual basis deny any buyers entry or refuse to accept any reasonable offer to buy your home your real estate brokerage could sue you. Most home listing agreements state that the real estate agent and their brokerage only need bring a buyer who is ready, willing and able to buy your home with a good offer in order for them to qualify for a commission. The fact that you as the seller rejected the reasonable offer does not mean you are off the hook for the commission. In most cases the brokerage will likely not pursue a lawsuit and instead will just let the situation go due to the cost of having to file the lawsuit and not wanting to create potential future bad will with other clients. The fact remains a seller can be sued if they fail to live up to their end of the bargain. If you do change your mind about selling your home, then be up front with your agent and they will likely understand and agree to remove your listing without much issue. Assuming there are no contingencies at issue (contingency meaning the offer is conditioned upon offer financing, home inspection, another home sale etc. ), if a buyer refuses to complete the purchase of a home the seller can file a lawsuit against the buyer. The seller has a couple of options when suing a buyer for failing to buy their home. The seller can sue seeking specific performance, which means the court will order the buyer complete the sale according to the terms of the offer. Or the seller can re-list the house for sale and attempt to sue the buyer for any loss they may have suffered from the delays caused by the buyer. At a minimum the buyer can lose any earnest money deposit they have put down unless the seller agrees to release the money back to the buyer. Courts will rarely order specific performance in the case of a buyer failing to purchase a home since money damages usually compensates the seller for any time they may have lost. This means the buyer must make their best efforts to satisfy their part of the purchase contract requirements. If the home purchase is contingent on getting financing, then the buyer must make an effort to apply for financing. If the buyer is unable to secure financing that is another story and should not cause the buyer to get sued. 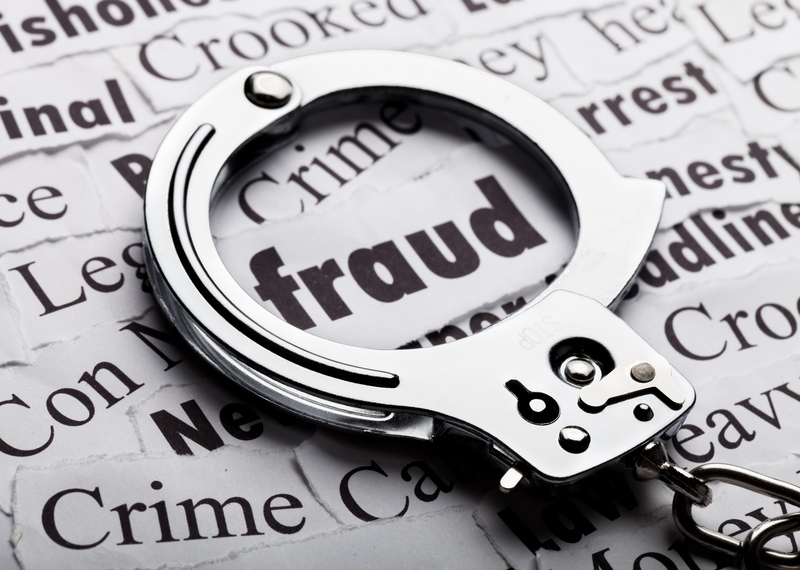 But if it can be shown that the buyer somehow intentionally acted not to apply for financing or failed to do something else required of them as part of the sale process then a lawsuit is possible. Bottom line where the buyer fails to do what they need to do as part of the purchase agreement the seller can sue the buyer for breach of contract. Normally the commissions paid to both the buyer and seller's real estate agent comes out of the sellers home final home price. While a seller could offer some discount if you deal directly with them, if you cut your agent out of the process you could get sued. A couple of factors come into play with this first did you have a Exclusive Buyers Agreement (EBA) with your agent? If you did have an EBA with you agent then it is possible than any house you buy regardless if the agent showed the house to you, you could owe a commission. If you did not have an EBA and the agent you were working with showed you the home that you end up purchasing (also known as the procuring cause) you could be facing a lawsuit for the value of the commission the agent would have earned had you not cut them out. In most states it is up to the broker to sue for the commission or not. This aspect does not usually involve the seller unless they are the ones lending you money to buy a home. If a seller is lending you money to buy a home then have a credit advisor or real estate attorney review the terms of the financing and explain to you in plain english what you are signing. If you are obtaining a loan from a third party lender be sure to read all the loan documents carefully. If you don't understand what you are signing find a neutral third party credit advisor and have them explain the terms to you. Even if you have to spend some money to have someone explain the mortgage terms to you, that is better than being sued and forced out of your home due to signing a bad loan you were never intended to repay due to bad terms. If you fall behind on your payments regardless of the loan type the lender will sue you and attempt to kick you out of your home. So make sure you are using trusted lenders and understand the terms of the loan you are signing. Before you bought your home hopefully you got a copy of the Homeowners Association (HOA) guidelines and looked them over to see what kind of restrictions there may be in place for your community. Violate any of the HOA restrictions and you could be sued. Most of the time you will get a warning for minor HOA infractions like parking a boat or a trailer in your front yard. Don't ignore the warning and figure out somewhere else to park your boat and that should be the end of the matter. Bigger problems will arise where you make some permanent physical changes to your house or land that are not allowed by the HOA rules. You may refuse to reverse the changes on principal or may not be able to afford to go back, but that won't matter. The HOA will sue you in court and demand that you comply with the HOA rules and regulations. To be safe before making any major permanent change to your house or your land read over your HOA rules and regulations and make sure what you are doing is not in violation of the rules. If you are not sure what you want to do is a violation of the rules then ask the HOA for clarification or seek outside legal help to get a legal opinion. While no means an all inclusive list, the above information should help you understand where many real estate pitfalls lie. If you should happen to find yourself the subject of a lawsuit then the first thing you should do is contact a qualified attorney to assist and advise you. To find a good real estate attorney ask your real estate agent if they know of any attorneys or call up the local bar association in your state or county and interview a few to get an idea of how they can help you. 20 Cold, Hard Facts In Real Estate Home Selling by Lynn Pineda. About the author: The above article “Top 10 Home Buying Misconceptions” was provided by Paul Sian. Paul can be reached at paul.sian@herrealtors.com or by phone at 513-560-8002. With over 10+ years experience, if you’re thinking of selling or buying, I would love to share my marketing knowledge and expertise.